There is no exact science to what constitutes constipation as the symptoms vary from person to person. It is ofen characterised by decreased bowel movements and straining at defaecation. Together Conveen Optima urisheat and Conveen Active urine bag completes the solution, for a reliable and discreet solution all day long. Its anti-leakage features, such as the anti-kink bellows,guard against blockage. It offers an applicator and roll-out strip for easy, secureapplication. A uriliner with double-sided adhesive allows forpersonal fit. Conveen Basic is our leg & bedside urine bag designed for basic functionality. Conveen Basic leg bag has a soft backing for increased wearing comfort.The bedside bag has a large capacity, making it easier for you to get a full night’s sleep. Conveen Contour is our multi-chamber leg bag designed for even distribution of urine. Conveen Contour’s multiple chambers ensure urine is more evenly distributed around the bag, preventing excess sloshing. Its purpose-designed “clamp” outlet has a simple flip-up/flip-down closure mechanism that makes it easier to see when the bag is open and closed and prevents accidental leakage. It offers a soft backing for increased wearing comfort. Its discreet design and color scheme makes it close to invisible under clothing. 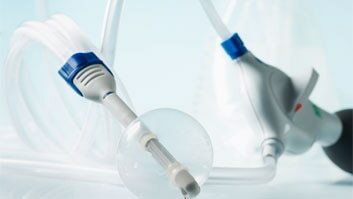 EasiCath® is a traditional hydrophilic-coated catheter for single use. All you have to do is to add water and wait 30 seconds then it’s ready to be used. The hydrophilic coating offers lower friction than uncoated and gel-lubricated catheters. The catheter eyelets are soft, rounded and lubricated. This makes the catheter gentle on the urethral mucosa and the catheterisation procedure more comfortable and safe. EasiCath is available in many different sizes to suit individual needs. The Conveen EasiCleanse is a no-rinse cleaning spray intended for cleansing of skin exposed to urine, faeces, and pus. Meet Coach Gumbie: Commissioner of the U.S. Quad Rugby Association and Coloplast catheter user. "Cathing used to be a 15 minute ordeal, but not anymore," he says. "Coloplast catheter is so quick and easy to use." At the age of 27, Julie was diagnosed with Multiple Sclerosis. As a result, she began experiencing urinary symptoms and had to start using catheters. Using our catheters has impacted her life. "It's a life-changer. I love it" she says.